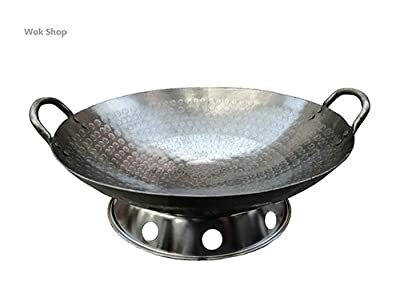 After a two-year mission to China, The Wok Shop finally was successful in manufacturing this fabulous hand-hammered wok in Guangdong Province. Beautifully dimpled from the hammering process, these woks are handsome enough to be showpiece and well-made enough to endure a lifetime of daily use. Now, available in flat bottom, 14"only, for electric coil stoves, grill tops. This wok is very easy to season and with gas heat, you will get 'wok hee', the breath of a wok. Gets hot quickly and retains heat. Carbon steel. Round bottom. Wok ring included with round bottom wok (flat bottom wok is not used with a wok ring). 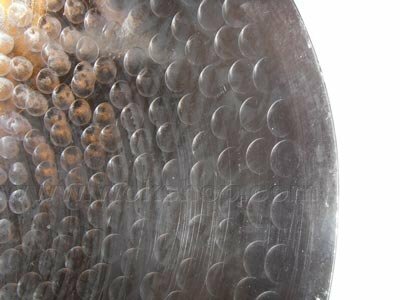 Beautifully dimpled from hammering process Easy to season, round bottom carbon steel wok Comes with wok ring (no wok ring w/flat bottom) Gets hot quickly and retains heat Wok size(18"/20"/22"/24") for commercial use.